Caves have fascinated humans for centuries. Experts estimate that the depth of a cave cannot be higher than 3,000 meters because of the pressure of the overlying rocks. Is there any cave going as deep as 3,000 meters? Such a cave hasn’t been discovered yet, but there are a few caves going deeper than 2,000 meters. Here we are going to take a look at the top 10 deepest caves in the world. The maximum surveyed depth of a cave represents the elevation from the highest entry point to the lowest accessible point. A cave is a natural hole that goes deep underground. They are formed over millions of years through various geological processes and atmospheric influences. People are drawn to caves because of the mystery, wonder, and thrill. Before we check out the top 10 deepest caves, it’s worth pointing out that the record holders keep changing as people explore caves and descend deeper than they have ever gone before. The ones that were at the top once have slipped through the rankings. There are many caves that haven’t been fully explored yet. Many of them are too dangerous for public recreation. Some of the world’s deepest caves are located in Abkhazia, which considers itself an independent nation after declaring independence in 1992. But Georgia claims it is part of its sovereign territory. The Republic of Abkhazia has received recognition from only 7 of 193 member states of the United Nations. Located in the Sierra Mazateca mountains of Mexico, it is 1,560 meters deep from the highest entrance point to the lowest point. According to National Geographic, it has 25 different entrances and more than 40 miles of mapped passageways. This cave was discovered in 1949 near the village of Hallstatt in Austria. Located in the Dachstein Mountains of the Austrian Alps, it is one of the world’s deepest and longest caves. It can take you more than two days to reach the deepest point. Hirlatzhöhle is one end of a large cave system that, if fully discovered, could be more than 2,200 meters deep and 300 miles long. There are many caves in Spain, and Torca del Cerro del Cuevón is the deepest of them. It goes 1,589 meters deep. The cave is located in the Principality of Asturias in north-west Spain. Experts consider it to be one of the most challenging descents in the world. Located in the French Alps, Jean Bernard was discovered in 1963 by the French adventure group Groupe Vulcain. Until 1980, it was considered the deepest cave on the planet. Reseau Jean Bernard has at least 13 known entrances. It has a length of 12.7 miles. Lamprechtsofen-Vogelschacht is a connected cave system in Austria. It has a maximum measured depth of 1,632 meters, but it could be much deeper than that. Spelunkers from around the world are still exploring it. It was considered the deepest cave in the world until the discovery of the Krubera cave in Georgia. Gouffre Mirolda is the deepest cave in France, and was the world’s deepest cave between January 2003 and July 2004. It was the world’s first cave to be explored more than 1,000 meters deep. The Illuzia-Snezhnaja-Mezhonnogo cave network lies in the Gagra mountain range in Abkhazia, Georgia. It has a maximum depth of 1,760 meters. Only the most experienced spelunkers dare to descent this cave network. It is made up of two caves: the Illuzia (Illusion) and Snezhnaja (Snowy). Sarma cave is also located in the Gagra mountain range of Abkhazia, Georgia. 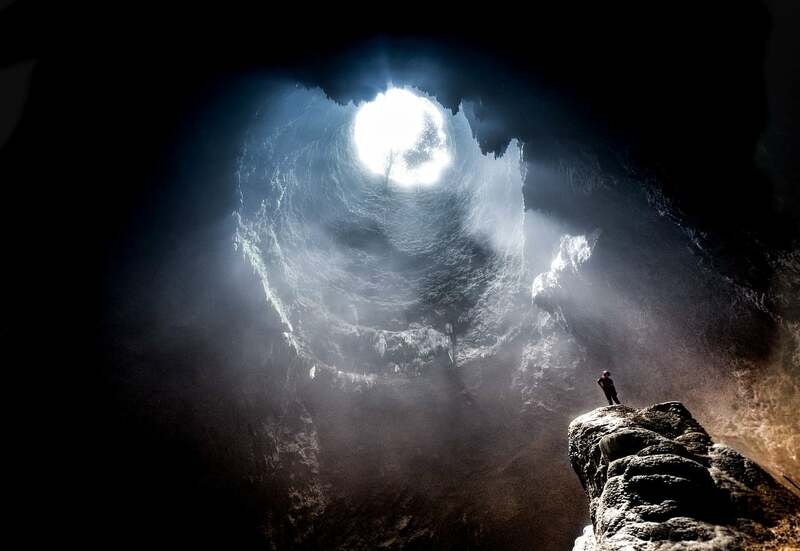 It is known to be at least 1,830 meters deep. Spelunkers continue to explore it, and there is a good chance they would descent deeper into the cave system. We wouldn’t be surprised if it becomes the deepest cave in the world in the near future. Also known as the Voronya cave, it is the second deepest cave on the planet with a maximum measured depth of 2,197 meters. It is located near the Sarma cave. Krubera was the first cave to be explored more than 2,000 meters down. Veryovkina is one of the only two known caves on Earth that go deeper than 2,000 meters. Its entrance is located in the Arabika Massif, Gagra Mountain Range of the West Caucasus in Georgia. Though it was discovered in 1968, spelunkers managed to reach its maximum depth of 2,212 meters only in March 2018. They are still exploring the cave.